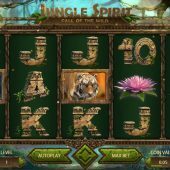 Jungle Spirit slot is a rare 243 way edition from Netent and the title is quite ironic when we see the word 'Wild' in the title - but we'll come to that in a minute! The theme is naturally animals of which we see the tiger, elephant, bear, crocodile and cobra featured along with vine-covered stone card symbols. The graphics aren't quite as crisp or defined as you might expect from a NetEnt game, with the reels spinning over a green background. There is a strange sound each time you spin and appropriate animal noises if a win appears on the reels. Symbols are all single and pink flowers represent the scatters on all reels of which 3 or more grant you a bonus round. You get a pay for 4 or 5 of them on top of the bonus trigger but not for 3. The animal tiles pay a maximum of 7.5x stake for 5-of-a-kind down to 1.5x for the lower card symbols. Remember me stating the title is ironic? Well, there are no Wilds in the game! Maybe 'Call of No Wilds' should be the actual name of this slot! This doesn't matter though as any symbol bar the scatter can be overlaid by a small golden butterfly, and if involved in a win it will expand to fill the reel. There is a random in-play addition to this expanding reel: on any spin the Golden Butterfly may appear and fly around the screen, expanding 1, 2 or 3 symbols of the same type to make a guaranteed win. This can be quite lucrative if you have a 4 or 5-of-a-kind as a result! Three or more scatters awards a good free games bonus. You will see 5 totems standing in a murky green pool of swamp water (looks suspiciously like the same pool graphic from their Creature from The Black Lagoon slot!) and on each totem there are the numbers 4, 8, 12, 16, 20 and above these the 5 animals tiger, elephant, bear, crocodile and cobra respectively are pictured. 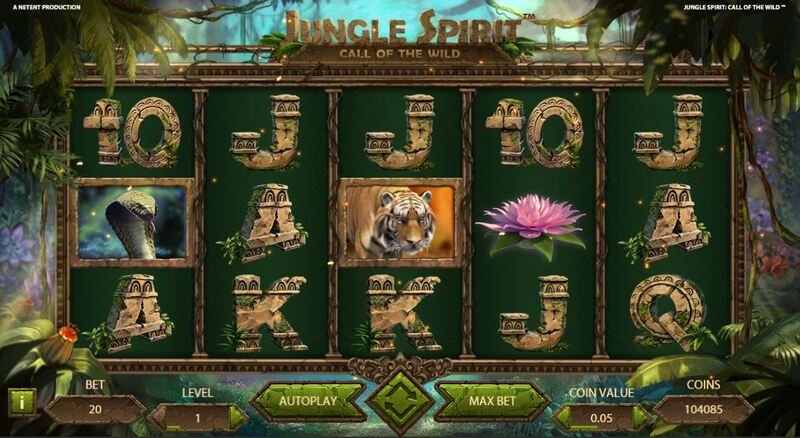 Your free spins will take place on a 1024 way 4-row grid, and only the animal you choose will be present on the reels along with the card symbols. You choose the volatility yourself; select 4 spins with the tiger (the highest paying animal) 8 with the elephant down to 20 with the cobra. Your spins start and you hope to see your animal appear on all 5 reels - if you do then one or more may have the golden butterfly overlaid and expand to fill all 4 rows. The game doesn't specify a limit to the overlaid symbols so assuming you could get all 5 expanding, you could get 1024x the 5-of-a-kind pay for the animal you chose! There is no retrigger as all the scatters disappear from the reels along with the 4 other animals you didn't choose.